Showing shades of grand old days when the mighy Gor Mahia towered over African teams, Gor Mahia today beat the Ghanaian national team aka Black stars that is preparing for the CHAN tournament to be held shortly next week by a score of 2-1. New signing Ezekiel Odera “Al Catel” who joined Kogalo from KCB, made a dream debut scoring the first goal via a header. The goal was set up by another new signing, Moses Odhiambo formerly of Rwanda APR , whose right wing cross was brilliantly finished by “Al Catel. Collins “Gattuso” Okoth netted the second goal from a superbly taken freekick that amazed the Ghanaians. Ghana’s goal came via an own goal. 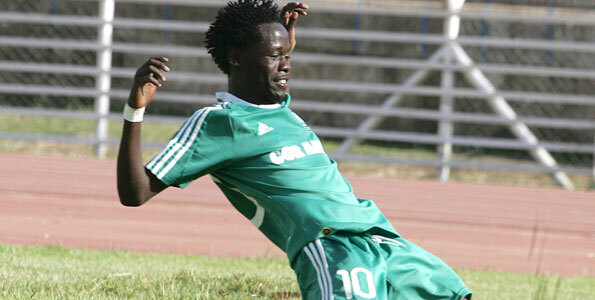 Gor Mahia have finally named their new squad for the 2011 season. Its a relatively low key list of names compared to the rumours that have been flying around. The established players signed are Ezekiel Odera from KCB, Moses Odhiambo and Collins Oloo from Mahakama. In addition, Kogalo have signed some promising players from schools and lower division teams. These include Roy Okal and Fred Otieno from Kodero Bara secondary school, Edwin Lavatsa from Upper Hill school and Boban Frederick from Uganda. Gor Mahia have lost Camerounais striker Baldwin Ngwa who has left to seek greener pastures in Tunisia after 2 seasons at the club. Abdimalik Mohammed is off to Sweden for trials with a second tier side. Peter Opiyo has rejoined his former club, Thika United. Others who have left are Andrew Ongwae and Philip Opiyo. AFC Leopards are rumored to be after Ibrahim Kitawi. The new signings will feature for the team in the friendly match against the Ghana national team at Nyayo stadium this on Sunday January 30th. Gor Mahia coach Zedekiah Otieno “Zico” who recently led the national team to 4th place at the Nile Basin football tournament, has been given an extension to his tenure as national tam coach. Citing the need for continuity, the Harambee stars board chairman Evans Kidero asked Zico to continue in his current position. Zico will now have the difficult task of balancing club responsibilities with national team responsibilities. Prior to this , Zico was assistant coach to Jacob Mulee and Twahir Muhiddin. He had previously functioned as assistant coach to Bernard Lama. Kogalo are now in training preparing for the new season with new signings Ezekiel Odera, Moses Odhiambo and Dennis “Wise” Okoth. The experienced Moses Odhiambo first made an impression in the Kenyan league while playing for Utalii back in 2003. He was immediately called up to the national team following his stellar play. He later left Kenya to join APR of Rwanda. He is now back in Kenya seeking a re-entry into the Kenyan league. In addition, the team is trying out new players from secondary schools. Kogalo has a great tradition of taking players straight out of secondary school and making them stars. Kogalo players were in fine form as they played pivotal roles in enabling the Kenya national team, Harambee stars to beat Sudan 1-0 in their opening match of the Nile Basin football tournament. This Sudanese team is highly experienced and is essentially a club team given that 8 of the starting players play for El merreikh which is one of the top teams in the continent. A club that is so well financed that some of their top players earn as much as 5000 Euros per month. You do the calculation and you will find that it is about 8 times what the top players in KPL make. Secondly, El Merreikh toured Kenya in 2008, 2009 and 2010, played Gor Mahia and other Kenyan teams, and soundly beat the locals. In 2009, Gor Mahia went down 0-5 to an El Merreikh team that had Nigerian dangerman Stephen Worgu in a friendly at Nyayo stadium. Game wise, the Sudanese dominated, using their vast experience and familiarity with each other. However the Kenyan defence battled gamely and keeper Francis Ochieng of Ulinzi had a stellar game. Musa Mohammed, Erik Masika, Collins Okoth, Teddy Akumu and Kevin Omondi all saw significant playing time. It was a menacing run by Omondi which resulted in a penalty when he was felled by a Sudanese player in the 17th minute. Club-mate Collins Okoth duly slotted the resulting penalty to give Kenya the win. Masika who came in as a sub, made a game saving play when he headed a goal-bound shot off the line after the Kenyan keeper was well beaten. All in all, a good outing for Kogalo players, valuable experience will be gained the youngsters especially if they get to play hosts Egypt. For stand in coach Zedekiah Otieno “Zico” who also doubles as Gor Mahia coach, it was a chance to justify his elevation to national team coach and his selection as coach of the year in all Kenyan sports. Striker George Odhiambo who became the first Kogalo player ever to sign for a European team and the 1st Kogalo player to win KPL player of the year, reached another milestone yesterday when he was named as one of the 100 most promising players in the world for the year 2011 by influential football website goal.com. Blackberry becomes only the second Kenyan to make this list after Dennis Oliech did the same 5 years ago. But he is the first player based in Kenya to attain such an honour. That such an influential website knows about Blackberry speaks volumes about Blackberry, about Gor Mahia and about the Kenya Premier League whose influence is fast gaining ascendance. Other Gor Mahia players who have won similar honours include the legendary Nahashon Oluoch “Lule” who in 1980 was named as one of the top 10 players in the continent after an amazing run in which Kogalo reached the finals of the Africa cup, becoming the first team in East and Central Africa to go that far in any continental event. In 1988, Peter Dawo was also named as one of the top 10 players on the continent after he scored 10 goals during the 1987 Africa Cup winners cup to enable Kogalo to lift the trophy. In another story, Blackberry’ Odhiambo has attributed his success in to veteran coach, James Siang’a as he becomes the latest Kenyan player to join the European ranks. He said apart from sporting his talent, Siang’a moulded him into what he is at the moment. He also thanked Gor Mahia fans for their passionate support and said he would miss them dearly. He has set his sights on playing in the English premier league for Arsenal, his favorite team.